Light up jewelry is nothing new – we see wearables all the time here. But home brew, self-contained, programmable LED earrings that are barely larger than the watch batteries which power them? That’s something worth looking into. Settle back and watch [mitxela]’s miniature wizardry in the video below, but be forewarned: it runs 36 minutes. Most of the video is necessarily shot through a microscope where giant fingers come perilously close to soldering iron and razor blade. 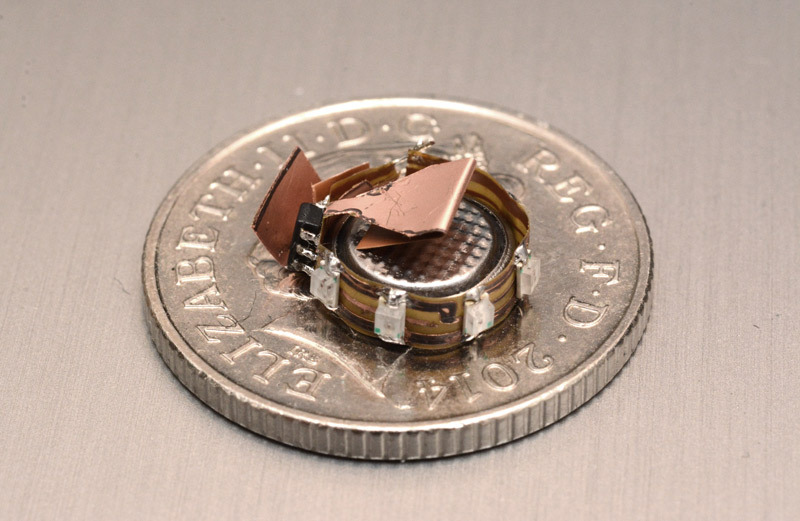 The heart of the project is an ATtiny9, a six-legged flea of a chip. The flexible PCB is fabricated from Pyralux, which is essentially copper-clad Kapton tape. [Mitxela] etched the board after removing spray-paint resist with a laser engraver – an interesting process in its own right. After some ridiculously tedious soldering, the whole circuit wraps around a CR927 battery and goes into a custom aluminum and polypropylene case, which required some delicate turning. Hung from off-the-shelf ear hooks, the 12 multiplexed LEDs flash fetchingly and are sure to attract attention, especially of those who know Morse. This isn’t exactly [mitxela]’s first tiny rodeo, of course. We’ve featured his work many times, including a Morse code USB keyboard, the world’s smallest MIDI synthesizer, and the world’s smallest MIDI synthesizer again. Thanks to [vikas] for the tip. this is insanely brilliant ! The real trick is to have an array, four in each ear, so one can flash messages in ASCII. Three hokes in each ear would be okay, just no lowercase. Once I had a very small board (~20*20mm) I used a piece of scrap plywood or acrylic of about 8 to 10cm size and some double sides tape to stick the PCB on it. So I could move it around as necessary, but it had enough weight to stay in place while soldering. He needed to find a way (adhesive tape, maybe) to secure the pcb to make it easier to work on. This is great! I liked the ferric chloride technique, seemed to work well and kept everything clean! Flash in Morse code one’s birth sign. I had a colleague who would take a red LED and a hearing-aid battery, stick the LED leads through his tie (this was back in the Late Bronze Age) and put the battery between the leads, scrupulously observing polarity, and secure the whole thing with a little sleeve of plastic tubing. He’d then put a dozen or so of each component in his pocket, proceed to his favorite watering-hole, and sell luminous tie-pins for $5.00 apiece. He never got rich but then he was never thirsty, either. and bits of thin material are inserted in the adjacent slots. 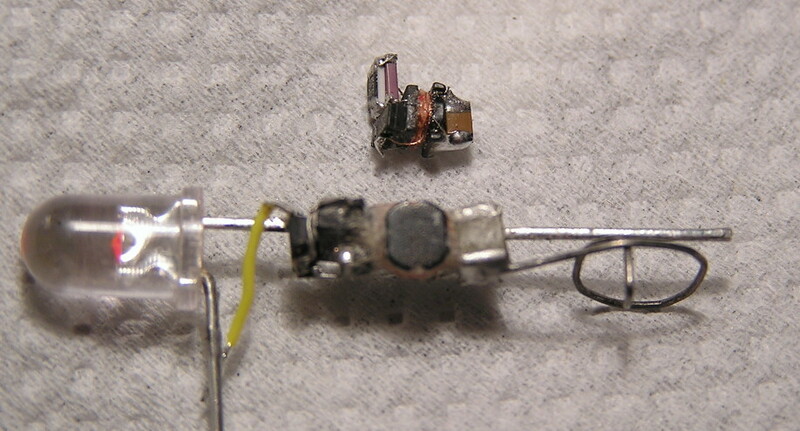 the devices are inserted upside down. Why even bother with a PCB ? missing : the tiny hearing-aid silver battery, overall the electronics (joule thief, µC) + tiny battery is smaller than a 927 Li battery. And the pink LED sends a morse message. 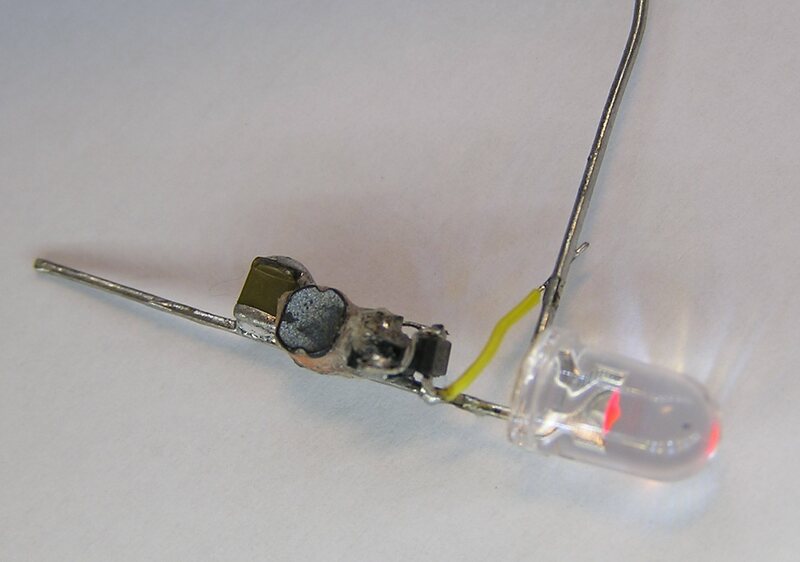 The LED from the first link is obvously lit red, but has no battery connected to it… wireless power? m, I think you’re seeing phosphor on the LED die, excited by ambient light or the camera flash. Does someone know if there’s a name for projects like this? When you try to make it as tiny as possible? It seems like I’m really into it! Fascinating device! It is possible though to use the metal plates as contacts to reprogram the unit.